Organocatalysis, that is the use of small organic molecules to catalyze organic transformations, has been included among the most successful concepts in asymmetric catalysis, and it has been used for the enantioselective construction of C–C, C–N, C–O, C–S, C–P and C–halide bonds. Since the seminal works in early 2000, the scientific community has been paying an ever-growing attention to the use of organocatalysts for the synthesis, with high yields and remarkable stereoselectivities, of optically active fine chemicals of interest for the pharmaceutical industry. 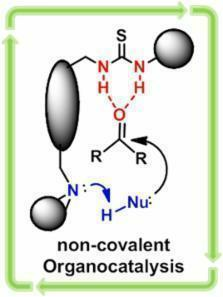 A brief overview is here presented about the two main classes of substrate activation by the catalyst: covalent organocatalysis and non-covalent organocatalysis, with a more stringent focus on some recent outcomes in the field of the latter and of hydrogen bond-based catalysis. Finally, some successful examples of heterogenization of organocatalysts are also discussed, in the view of a potential industrial exploitation. Copyright statement: © 2015 C. Palumbo and M. Guidotti. Bifunctional organocatalysts for enantioselective aza-Morita-Baylis-Hillman reaction. Making carbon-nitrogen bonds in biological and chemical synthesis.